How much do you trust your people? In organisations with a ‘command and control’ culture there is the expectation that orders should be followed to achieve a desired result – rather like following the instructions from a sat nav to reach a destination. This may usually work well, but learning is limited, and the dependency on the sat nav can leave the driver lost or stuck if anything goes wrong with it. In organisations where individuals are trusted to take more responsibility for their work people have an incentive to take more care, and can become more invested in their outcomes. They are reading the map and charting the route, and having to be alert to their surroundings. Things will go wrong from time to time, but then lessons can be learnt and better solutions found. Sometimes taking a new turning will lead to discoveries and opportunities that would never have appeared on the sat nav. John le Carré really nails what is at the heart of any great story; drama. By establishing conflict in a situation, the need to restore order and balance becomes the motivation for action. The unfolding story is the journey taken to make sense of the conflict, define the challenges, and undertake the transformation required to meet them. The drama of organisational change can be scary, so people need to be clear what's at stake for them and their organisation. When change is complex and hard to grasp, a story can help people understand the connection between cause and affect, to make sense of what is going on around them, and think about what might happen to them. It can provide a lens through which they create shared meaning around what needs to change, and help clarify what actions they need to take ownership of. When a story speaks to people's concerns and aspirations it can be compelling, affecting the way they think, feel, act and behave. It gives them the context they need to make sense of - and take responsibility for - their part in achieving it's outcomes. We believe that a compelling story is one of the most important elements of a change programme – it helps employees make sense of what’s at stake and take ownership of the organisation’s journey by seeing themselves within it. 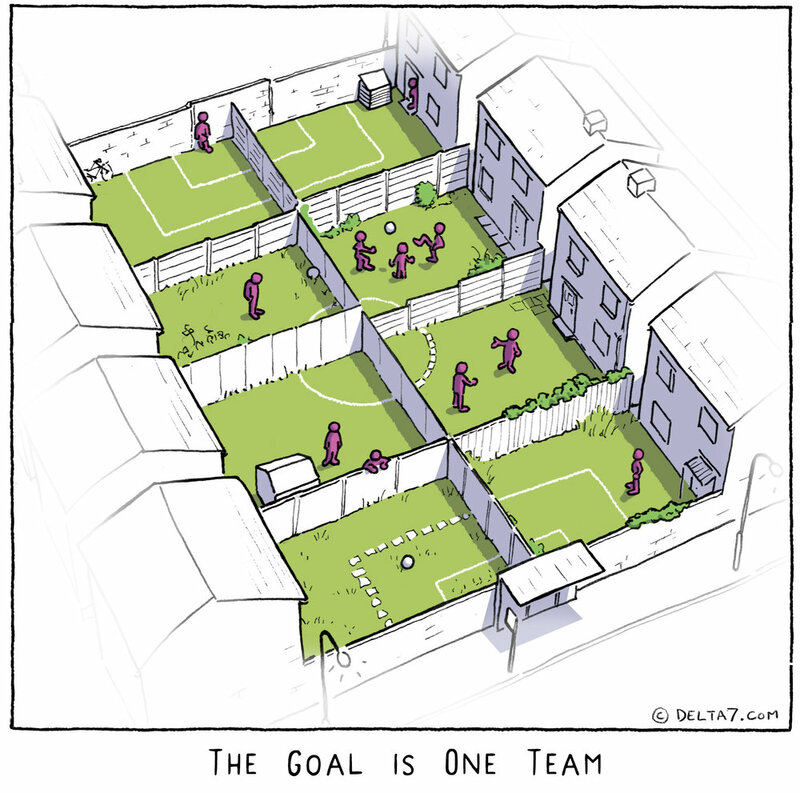 This is a metaphor that came up recently in one of our projects during an employee input session. The conversation highlighted their frustration at not having time to stop and consider whether the way they were doing things was necessarily the best. With the pressures of a working environment it can be hard to find time to take stock of how we do things, something that can appear to be counter intuitive. However this ends up trapping us in a vicious cycle where nothing changes despite our full knowledge of the situation. It can take a deliberate intervention to recognise the value of stopping and reflecting on what's going on. The metaphors we use at work help us to connect the words we use to the meanings we make of our experience. Metaphor in greek means “to transfer, or connect”. A good metaphor is a bridge of meaning, helping us to understanding one thing, or experience, in terms of another. Metaphors can influence, and sometimes limit, how we see and understand the world. Once created they can drop below our radar and become unconscious and habitual, implicit assumptions that influence our thinking and behaviour. When organisations are in crisis mode and under pressure to change, we often hear a cry of "we need to change mindsets!" Generating new metaphors can be one way of opening up new possibilities and give us new ways of seeing things. I’ve been wondering a lot about the metaphors we use as O.D. practitioners. For example, the metaphor Self-As-Instrument helps us to conceptualise our agency and impact in service of our clients. It works as an easy anchor point to help encompass what we want to learn to develop our skills and capabilities as O.D. practitioners. Learning to be more present, self-aware, empathic and better at deep listening when we work with clients is central to our effectiveness and the value we bring to organisations. I'm curious about how this metaphor affects how I experience myself when working with clients. What kind of instrument am I? A spade? And microscope? A calculator? A scalpel? A dictionary definition of instrument is something like "a mechanical implement for delicate and precise work”. I don’t normally feel like an instrument that does things to other people. My experience of the complexity and richness of face to face interactions gives me a sense that having impact or influence isn’t as simple or controllable as the instrument metaphor seems to imply. What could a new metaphor be? For me this metaphor could be reinforcing a transactional rather than a relational attitude to being with others ; one of “doing-to” rather than “being-with”, which feels much more appropriate when working alongside clients. I get a sense that the underlying assumption of this metaphor defines people as things, and as discrete objects that can be “changed" in some transactional and intentional way, which is another implicit assumption worth shining a light on. There is also a question for me of this metaphor about what it means to be a "Self". Am I an independent rational self with control over my will and identity? Or am I inextricably bound up with and entangled with others and the relationships that continuously form and reform me? It would be really interesting to explore these questions further and inhabit them as a way to help deepen our O.D. skills and capabilities. To inquire into how we see our selves and our effectiveness in more creative and less rational ways could be really useful. What new metaphors or generative images could we create together to open up new possibilities and come to see ourselves and each other in new and more productive ways? If, as an O.D. practitioner, I shifted my thinking about my role as a “Self-As-Instrument”, what new ways of relating might I start to experience?